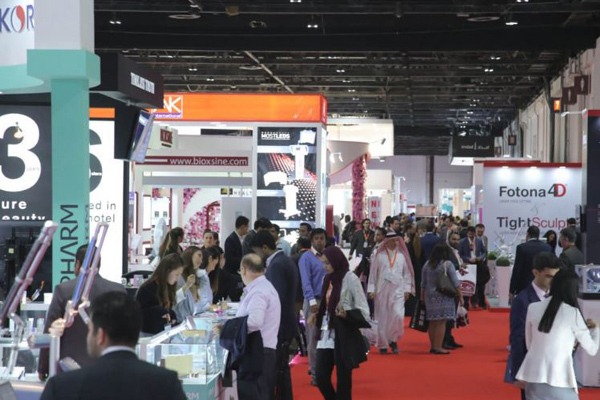 A number of business deals worth Dh440 million ($119.79 million) were closed at the 18th edition of Dubai World Dermatology and Laser Conference and Exhibition (Dubai Derma), which was held in Dubai, UAE. The event concluded yesterday (March 21) after three days of highly successful discussions at the Dubai International Convention and Exhibition Centre, attracting over 15,000 visitors and participants and featuring highly specialised discussions on a number of key themes and topics related to skincare and the latest treatment methodologies, reported state news agency Wam. Anas Al Madani, vice chairman and group CEO of Index Holding, the event organiser, said that over the years the event has firmly positioned itself as the leading global skin conference and exhibition in the Middle East, North Africa and the Indian subcontinent. He added that with its rich scientific agenda, key trending topics and a list of world-renowned speakers, the latest edition attracted over 15,000 visitors and participants, while also featuring the participation of 540 companies from 95 countries. On the sidelines of the conference and exhibition, the scientific committee yesterday announced the recommendations of the 18th edition of the event. Dr Ibrahim Galadari, chairman of the Dubai Derma Conference and Professor of Dermatology at the UAE University, announced the following recommendations. Ensure that the scientific requirements for practicing the profession in this field are obtained for both, doctors and technicians and emphasise tougher restrictions over the use of cosmetics, especially laser, Botox and fillers, to avoid medical errors that may occur upon misuse. Stress the support of physicians, especially trainees and those registered in medical training programmes, such as the Arab Board and other specialised programs in the Arab World. Other recommendations include emphasising the need to organise workshops for physicians, especially workshops in which physicians acquire certain skills in the field of dermatology, plastic surgery and laser intervention and the need to exchange medical experiences and ethics, particularly in the area of skin beautification. On the third and final day at the event, world-renowned skin health experts and specialists from the UAE and abroad discussed a number of topics on skincare under various sessions including hair, immunology, therapeutics, cutaneous manifestations in systematic diseases and treatment challenges. Expert discussions on complicated cases, cosmetic dermatology, innovations, vitamin D level in acne patients and its association with disease severity, among others, were also discussed.